Solution: Aldol condensations, even with ketones, can occur under acid conditions where the active nucleophile is the enol, not the enolate ion. For the aldol condensation shown for acetone, what would be the structure of the electrophilic species that the enol attacks? Aldol condensations, even with ketones, can occur under acid conditions where the active nucleophile is the enol, not the enolate ion. For the aldol condensation shown for acetone, what would be the structure of the electrophilic species that the enol attacks? What would be the major product of this reaction? 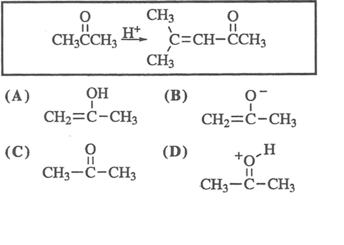 What is the product of the following reaction?